This kit recognizes natural and recombinant DCN. No significant cross-reactivity or interference between DCN and analogues was observed. Small volumes of DCN clia kit vial(s) may occasionally become entrapped in the seal of the product vial during shipment and storage. If necessary, briefly centrifuge the vial on a tabletop centrifuge to dislodge any liquid in the container`s cap. Certain products may require to ship with dry ice and additional dry ice fee may apply. Intended Uses: This CLIA kit applies to the in vitro quantitative determination of DCN concentrations in serum, plasma and other biological fluids. Principle of the Assay: This kit uses Sandwich-CLIA as the method. The micro CLIA plate provided in this kit has been pre-coated with an antibody specific to DCN. Standards or samples are added to the appropriate micro CLIA plate wells and combined with the specific antibody. 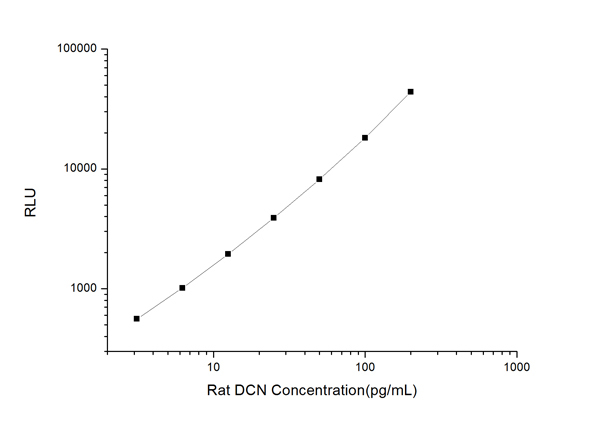 Then a biotinylated detection antibody specific for DCN and Avidin-Horseradish Peroxidase (HRP) conjugate is added to each micro plate well successively and incubated. Free components are washed away. The substrate solution is added to each well. Only those wells that contain DCN, biotinylated detection antibody and Avidin-HRP conjugate will appear fluorescence. The Relative light unit (RLU) value is measured spectrophotometrically by the Chemiluminescence immunoassay analyzer. The RLU value is positively associated with the concentration of DCN. You can calculate the concentration of DCN in the samples by comparing the RLU value of the samples to the standard curve. NCBI/Uniprot data below describe general gene information for DCN. It may not necessarily be applicable to this product. DCN: May affect the rate of fibrils formation. Defects in DCN are the cause of congenital stromal corneal dystrophy (CSCD). Corneal dystrophies are inherited, bilateral, primary alterations of the cornea that are not associated with prior inflammation or secondary to systemic disease. Most show autosomal dominant inheritance. Belongs to the small leucine-rich proteoglycan (SLRP) family. SLRP class I subfamily. 5 isoforms of the human protein are produced by alternative splicing. 1. A role for decorin and p-Smad-2 in the pathophysiology of fetal membranes and adverse pregnancy outcomes.